BEIJING, China (CNN) -- Grand fireworks and spectacular choreography brought to a close the Beijing Games Sunday as one of the most remarkable Olympics in recent history were declared at an end. 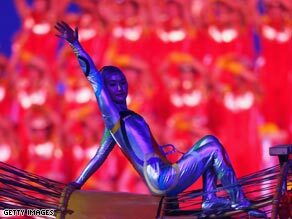 A dancer performs Sunday during the Olympics Closing Ceremony in Beijing. Fireworks across China's capital as a crowd of more than 90,000 at the landmark "Bird's Nest" National Stadium watched the pyrotechnics. The ceremony marked a climax to a Games that has delivered many world-breaking sporting performances and redefined the international image of the communist nation. "Tonight, we come to the end of 16 glorious days which we will cherish forever," IOC President Jacques Rogge said. "Through these Games, the world learned more about China, and China learned more about the world." "These were truly exceptional games," he said, declaring them formally closed. China had invested more than $40 billion in the games, which it viewed as a chance to show the world its dramatic economic progress. Unlike previous Summer Olympics, logistics appeared to run smoothly for the Games. Also impressive was the emergence of a new world sporting superpower -- the host nation. China, which won its first Summer Olympic gold medal in 1984, clinched first place in the gold medal standings long before the final hours of sporting competition came to a close. The United States led the overall Medals table. E-mail us: What did you think of the Olympics in China? However, questions and criticism remained about China's stance on free speech and political protest. Objections were raised over certain Web sites being blocked. And although Chinese organizers had created designated "protest zones," people allowed to protest appeared non-existent. Demonstrators at unauthorized protests were detained. On the final weekend of the Olympics, U.S. diplomatic officials raised concern to Beijing over eight Americans arrested the previous week for planning or staging protests. Worries over pollution and its impact on athletes seemed to fade away. Distance running events ran smoothly, and while the air was thick with smog on many days during the Games, foreign media did not report widespread health concerns by the tens of thousands of foreigners attending the Games.